100 cars have entered the pit area. However, following inspection one will load up and head home. Ricky Weiss has failed inspection. The team has elected to load up and head home. Heavy rains dropped on the speedway today. It’s going to be a late night as qualifying gets underway just past 11PM. 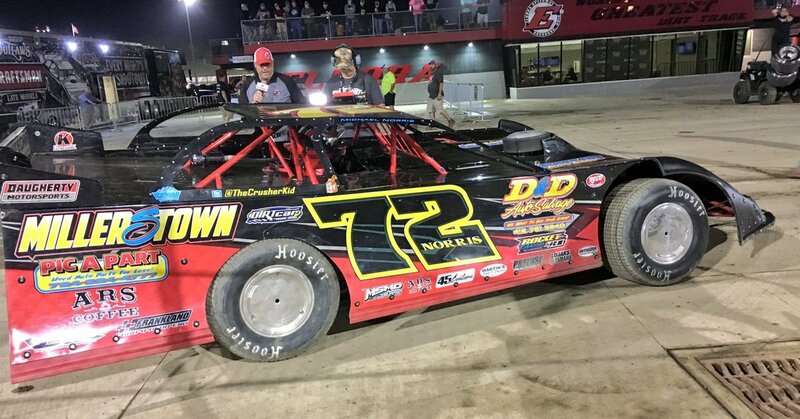 Scott James jumped the cushion and tagged the wall in qualifying. Brandon Sheppard sets the overall quick time. The Rocket 1 Racing team turned a 15.203. Sheppard has a flat tire in the staging area. The crew swaps that out and heads to the inspection line before returning to the grid. 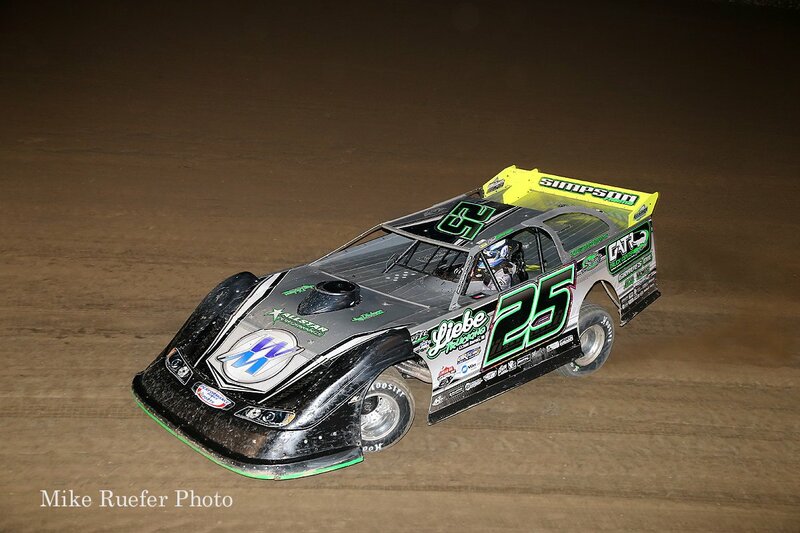 Cade Dillard and Scott Bloomquist will set the front row. They run even into turn 1. 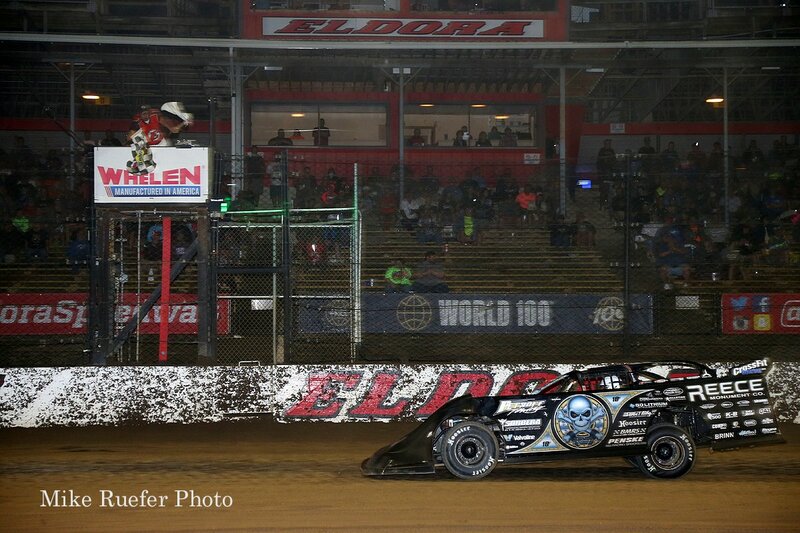 Bloomquist jumps the cushion in turn 1. Dillard noses ahead on the bottom. 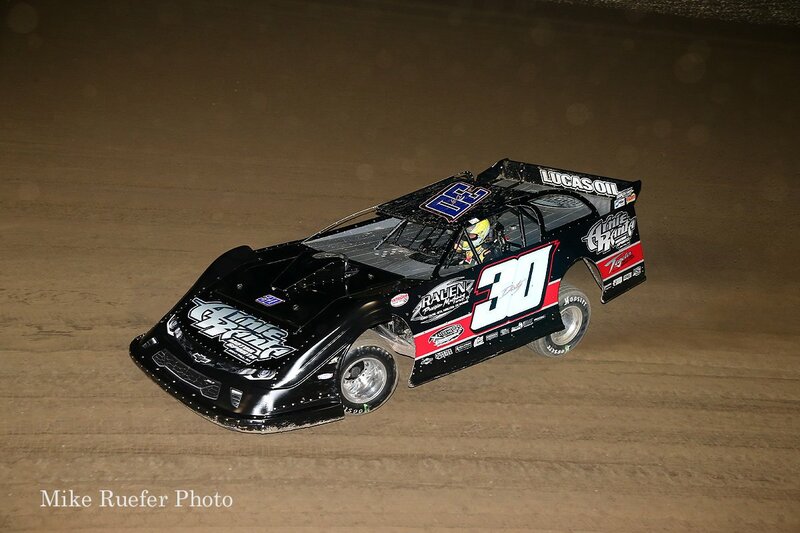 Bloomquist gathers it up quickly and retakes the lead on the outside in turn three. 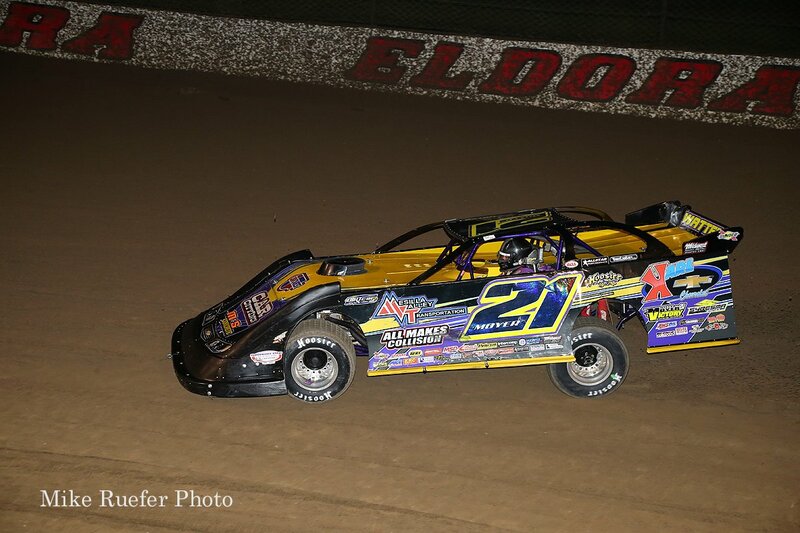 Dillard and Bloomquist make light contact. Lap 5, Sheppard works around Dillard to take 2nd. 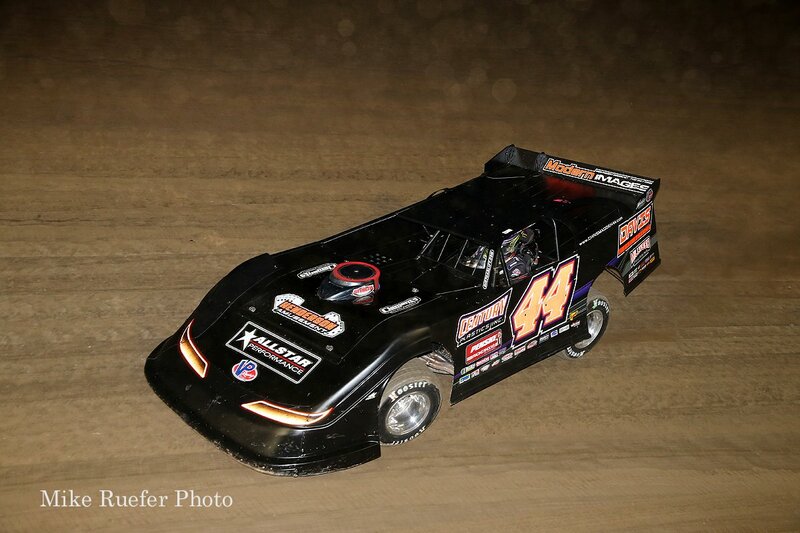 Bloomquist is a full 3 second up the road. Lap 8, Dillard has a flat. The caution is out. Bloomquist selects the outside lane. Green, Bloomquist leads by two car lengths into turn 1. He opens the gap by 6 car lengths into turn three. Bloomquist smokes them in the first heat race of the night! Chad Simpson and Billy Moyer Jr set the front row for heat two. Shannon Babb didn’t make the call for the start. Green, Simpson gets the jump on the bottom. Ferguson gets into the left rear of Moyer Jr. Both cars are locked and stopped over the cushion. Green, Simpson leads Rowan into turn one. Ferguson climbs from the back to 5th in a hurry. 3 to go, Ferguson is all over Bronson for the final transfer spot. At the front, Simpson is miles ahead. Chad Simpson wins heat race number two! Chris Madden and Devin Gilpin trail the pace truck ahead of heat three. Green, Madden leads. Richards bobbles on the bottom. Richards drives it deep into turn three. He slides Gilpin as Gilpin jumps the cushion as Richards slide inches in front of his nose. Lap 5, Richards is running down Madden. McDowell is on the bumper of Richards. It’s short lived as Madden opens the gap back up. Chris Madden takes the win in heat three! Kent Robinson and Brian Birkhofer will lead them to the starting line in heat four. Green, they run even at the line. Brikhofer noses ahead on the top. Robinson has to lift on the bottom as he bobbles. Brikhofer is gone. He wins heat race number four! Michael Norris and Dustin Nobbe will lead them to the flag stand in heat five. Green, Nobbe and Norris run side by side into turn one. They’re still side by side of turn two. They’re heading into turn three. Norris drives it deep on the bottom. He slides across the nose of Nobbe and takes the top groove away. Norris leads off turn four. Michael Norris wins heat race number five! Robby Hensley and Frank Heckenast Jr set row one for heat six. Green, Hensley leads into turn one. McIntosh drives it deep on the bottom in turn three, he slides Heckenast for 2nd. Lap 4, McIntosh bobbles into turn 1. Heckenast drives by. Lap 5, McIntosh drives it to the bottom on Heckenast. The door is shut and McIntosh lets off the throttle. McIntosh bobbles again, he’s under fire for the final transfer spot. Robby Hensley wins heat race number six! Ryan King slides McIntosh on the final corner! Shannon Thornsberry and Ivedent Lloyd Jr line up first for heat seven. Green, Marler powers to the lead. Casebolt is slow on track and the caution is out. Green, Marlar and Lloyd Jr run even into turn one. Marlar takes the position on the top. Mike Marlar drives away to take the win in heat seven! Tim McCreadie and Brian Shirley line up first for heat race number eight. Green, Mccreadie spins the tires on the bottom. Row two is looking for a way by the front row. Brian Shirley leads into turn one. Lap 2, Davenport is all over McCreadie for 2nd. He keeps looking to the bottom but the top has too much speed. At the front, Shirley is gone. He cruises to the the win in heat eight! Billy Moyer and Joey Coulter will lead them to the starting line in hear race number nine. Green, as Moyer gets on the gas his rear end moves to the right. It makes contact with the left front of Coulter. Moyer is nearly hooked into the outside wall but he gathers it up as Coulter lifts. Moyer moves to 2nd. Lap 4, Coulter has come to a stop of the track. The caution is out. He was running inside a transfer spot but he’s now getting a push to the pit area. Green, Moyer leads by a car length at the flag stand. Erb and O’Neal battle for 2nd. O’Neal takes the position. O’Neal is running down the leader. 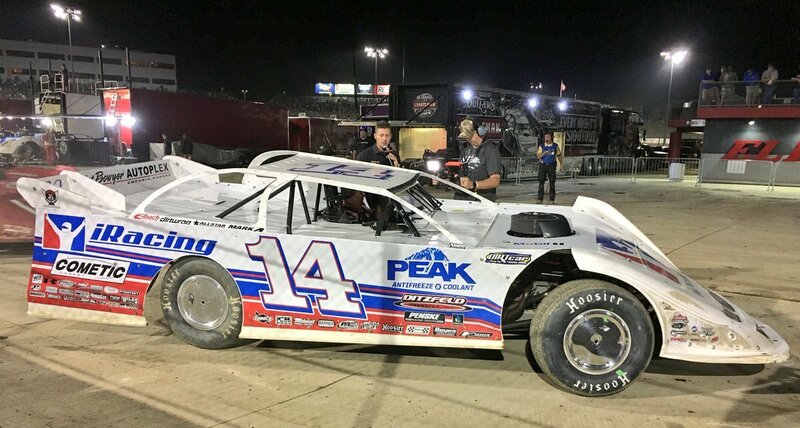 Billy Moyer takes the win in heat nine! Darrell Lanigan and Freddie Carpenter trail the pace truck ahead of the final heat race of the night. Green, Lanigan jumps on the throttle and heads to the bottom off turn 4 to grab the traction. Lanigan noses ahead into turn one. Carpenter jumps the cushion as Lanigan slides up the hill. Lanigan leads off turn two. Carpenter, Mars and Pearson Jr run 3 wide off turn two. Pearson backs out. Spin at the back, caution. Green, Lanigan leads as Mars holds 2nd. Pearson takes 2nd away. 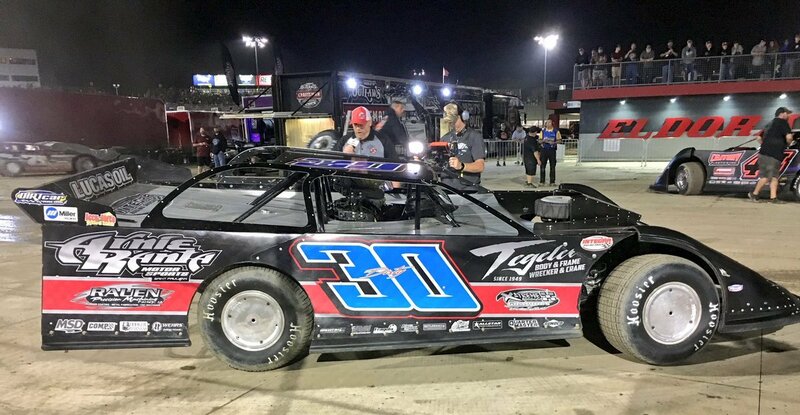 Darrell Lanigan takes the win in the final heat race of the night! Billy Moyer and Josh Richards trail the pace truck ahead of the first main event on the night. 4 wide salute and they’re ready for the startling line. Green flag, Moyer gets the jump he leads by a car length into turn 1. Richards runs wide into turn one. Norris moves to 2nd. Lap 5, Mike Marlar is hard into the wall. Marlar bounced off the cushion hard while running 5th. Something broke on the front end and he went up the hill and into the wall. The caution is out. Green, Moyer gets the jump, Norris holds 2nd. They run 3 wide for 3rd. Lap 10, Bloomquist looks inside of Don O’Neal for 3rd. He completes the pass on the bottom. Everyone else is locked on the cushion. Bloomquist has a lane of his own. He runs the middle in turn one and the bottom in turn three. Lap 14, slow car on the front. The caution is out. Green, Norris looks low on Moyer into turn one. Moyer holds him off. 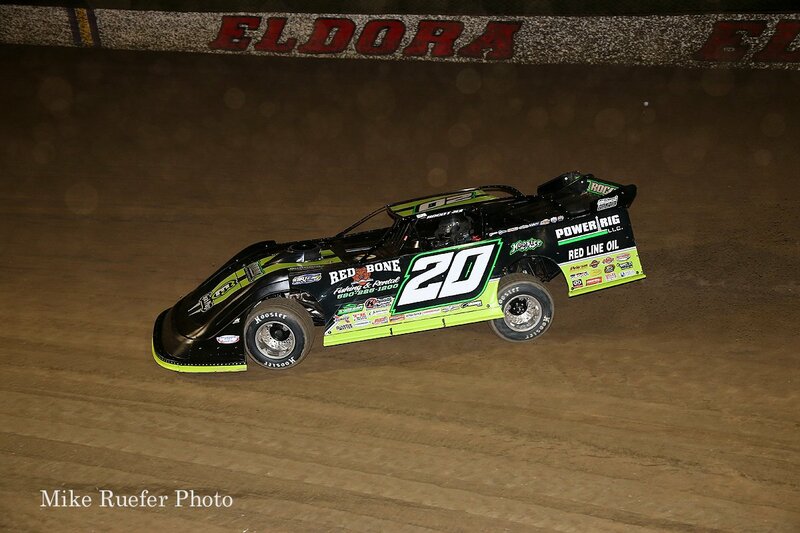 Bloomquist has a run off turn two. 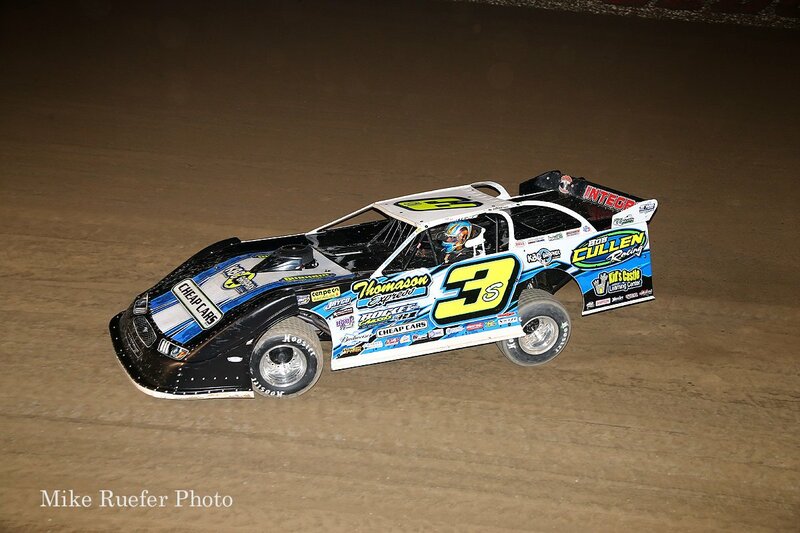 Bloomquist takes 2nd away on the bottom in turn three. 7 to go, Bloomquist has caught the leader. Moyer runs the top, Bloomquist runs the middle. 5 to go, Moyer jumps the cushion in turn 1! 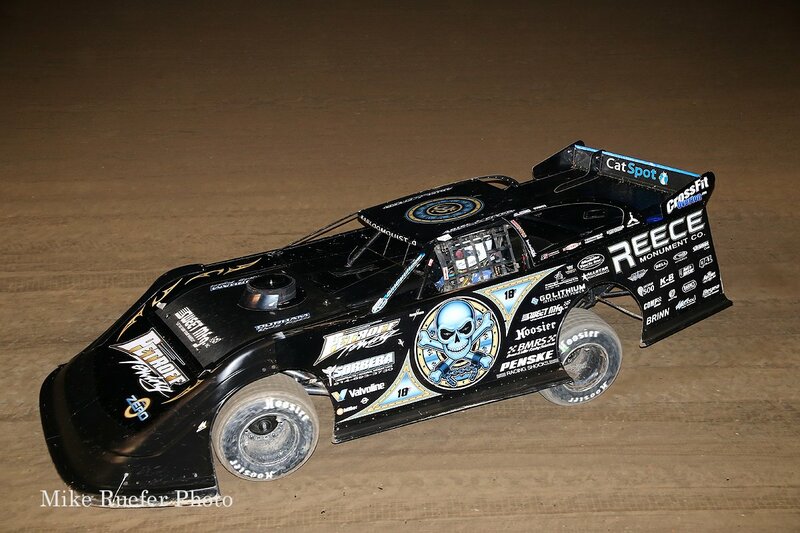 Bloomquist drives by on the bottom. 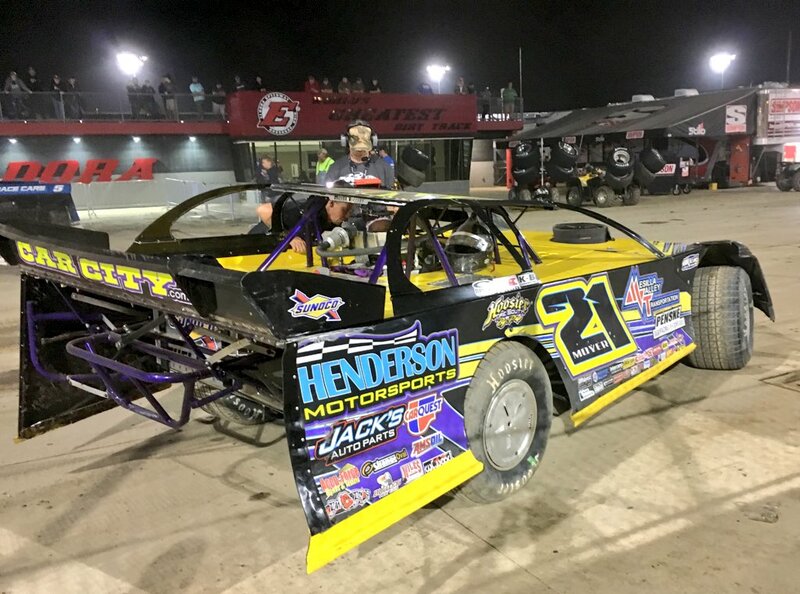 3 to go, Bloomquist has smoke coming out of the back of his machine. He leads by over a second. 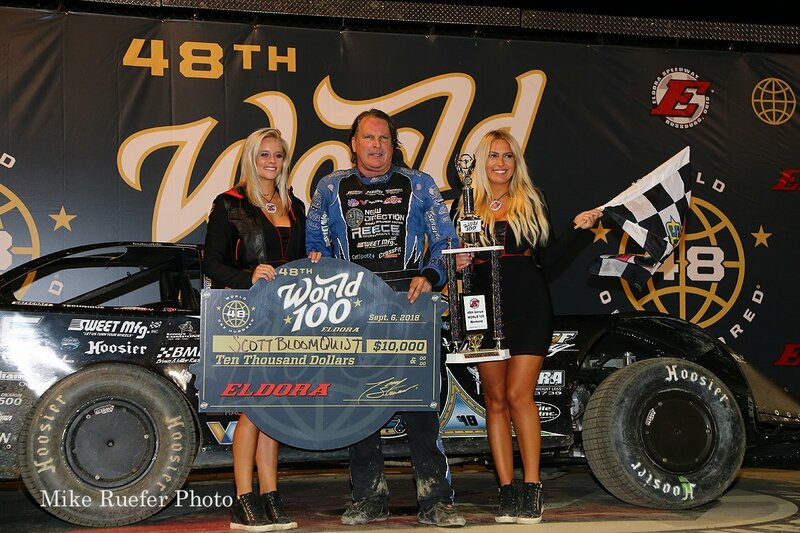 Scott Bloomquist wins the first main event of the night! Jimmy Owens and Brian Birkhofer will lead them to the start. The second for wide salute of the night and we’re ready for another main event at 3:45am. Green flag, Owens heads to the bottom. Birkhofer heads for the top. Owens takes the lead off turn two. Lap 10, Owens leads Shirley by several seconds. Shirley makes contact with the lap car of Rowan. Lap 15, Rowan has come to a stop. The caution is out. Kent Robinson slides into the stopped race car. Owens’ huge lead has been evaporated. Green, Owens leads. Shirley hits the cushion, he rolls through the ruts up top. Birkhofer drives it to the bottom. Birkhofer takes the smooth line, slides up and takes the position off turn two. 6 to go, Owens jumps the cushion! Birkhofer comes to his rear bumper. 5 to go, Frank Heckenast Jr has a flat. The caution is back out. Green, Owens leads on the bottom. Birkhofer holds 2nd. 2 to go, Owens rolls through the ruts in turn 1. The car bounces but he holds control of it. Jimmy Owens wins the second prelim main event! 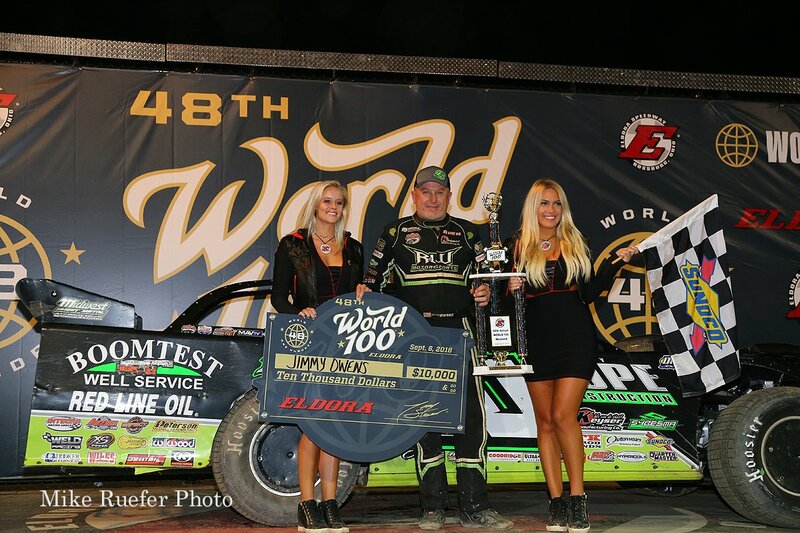 View full Eldora Speedway race results below.